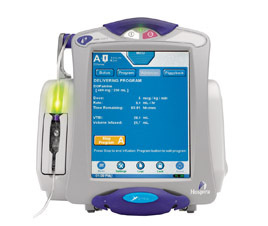 There is an FDA Class I recall of Symbig Infusion Pumps One channel, model 16026 and Dual channels, model 16027 made by Hospira due to the potential for unrestricted flow of fluid or medication if the administration set (cassette) is removed before the cassette carriage fully opens and the slide/roller clamp is not closed. Additionally, when unrestricted flow occurs, the “Check Flow Stop” alarm, which is designed to notify users of a free flow condition, may not function as intended and may not provide appropriate warning to users. Confirm the infusion pump is in “Stop” mode, and close the administration set roller clamp, and/or slide clamp, prior to removing the cassette from the infuser. Press the “Load/Eject” button to open the cassette carriage. Ensure the cassette carriage is fully opened. Do not remove the administration set until movement of the cassette carriage has stopped. Grasp the tubing above and below the cassette. Slide the cassette upward and out of the cassette carriage. The cassette carriage will close automatically in approximately 10 seconds. Alternatively, press the “Load/Eject” button to close the cassette carriage sooner. To discontinue use of the device, press and hold the “On/Off” button for one second to power down. Discard the administration set and fluid container per Centers for Disease Control, hospital, or healthcare provider guidelines. For more information on this FDA recall, click here. ← Vesicants: not just chemo agents!